A Rope is a relatively rare object in the Mario franchise. Ropes initially appear in Super Mario Bros. and Super Mario Bros.: The Lost Levels as a support for the bridge that Bowser and his fakes stand on, presumably broken by the axe. In Yume Kōjō: Doki Doki Panic and Super Mario Bros. 2, they are used as a support for the drawbridge of the entrance to Yume Kōjō. Ropes first appear as an interactive object in Super Mario World, where they are placed vertically and used similarly to vines. In the game, they are usually linked to a mechanism moving constantly left and right (or up and down), allowing Mario and Luigi to grab onto the rope and thus to cross pits, for example. When riding Yoshi, however, the player cannot grab the rope. Ropes are also featured as a somewhat prominent gameplay element in Donkey Kong for Game Boy. In the Mario Party series, ropes are mainly found in Minigames. In Hot Rope Jump, located in Mario Party and Mario Party 2, the players are supposed to jump over a rope made of Podoboos. In Get a Rope in Mario Party 5, the player's task is to choose one out of three ropes. Chump Rope in Mario Party 8 has a similar objective compared to Hot Rope Jump; however, it is a 1-vs.-3 player minigame opposed to the 4-player minigame. A jump-rope once again appears in Skipping Class of Mario Party 9, and later in the Metro Kingdom in Super Mario Odyssey. 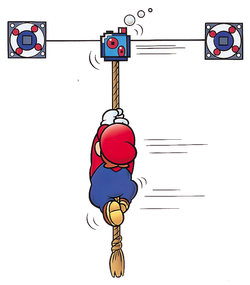 Ropes also appear in the New Super Mario Bros. series, where their behavior has slightly changed. In New Super Mario Bros., they are mostly found on ceilings instead of tracks. When the player starts grabbing onto a rope, it starts swinging and the player can adjust its speed and movement my changing positions on the rope before jumping off. Exclusively found in World 6-B and a bonus area in World 7-1 are ropes that are on tracks, similar to Super Mario World. There are also vines that appear in jungle themed levels which serve the same purpose as ropes other than appearance. In New Super Mario Bros. Wii and New Super Mario Bros. U, the ropes are replaced with chains, which serve the same purpose as ropes other than appearance. In New Super Mario Bros. 2 the ropes and vines now swing automatically and the player is unable to adjust their speed and movement. There are also ropes that hang horizontally on ceilings that the player can climb through to reach other areas. Ropes also appear in the Donkey Kong franchise. Ghostly Ropes can be found in Ghostly Grove, a level from Donkey Kong Country 2: Diddy's Kong Quest and Donkey Kong Land 2. The level Konveyor Rope Klash in Donkey Kong Country 3: Dixie Kong's Double Trouble! heavily features ropes. A Tightrope is a horizontal type of rope in New Super Mario Bros., Super Mario 3D Land and New Super Mario Bros. 2. In the former, it acts as a normal platform, although Mario moves slower on it. However, he can jump higher, similar to the ropes in Super Mario Sunshine. In New Super Mario Bros., tightropes only appear in the World-1 Castle. If Mario or Luigi stand still on one too long, they lose their balance and fall off if they do not move or jump in time. Sometimes as Shell Mario or Luigi, if they do a shell dash on it to reach the end point, it continues rolling after they let go from running or jump up high. In Super Mario 3D Land, it acts the same as the ones in New Super Mario Bros. Fuzzies appear on tightropes in this game, acting in a way comparable to Wire Traps. There are structures in Luigi's Mansion: Dark Moon that Luigi can walk on, however, he cannot just simply walk across one. To walk on it, the player needs to to regain balance; if Luigi falls, he loses 10 HP. This page was last edited on February 9, 2019, at 20:13.